Love beer but fed up of the weak and flavourless concoctions you get served in your local bar? Want to try a selection of delicious craft beers in the comfort of your own home. With a Beer52 code you can try the world’s number 1 craft beer club for less. All you need to do is log on to beer52.com and enter your Beer52 voucher to get great deals on this amazing club! Beer52 was founded to act as an antidote to bad beer everywhere. Bored of the same uninspired selections in local bars and supermarkets, the team behind this unique venture decided to create an affordable and easy way for people who love good beer to discover exciting new brands and flavours and find a new favourite brew. What’s more, they also offer the opportunity to save while you shop by using a Beer52 code! The company was started by an innovative beer-lover who discovered quality, unusual beverages while on an epic road trip from Edinburgh to Faro on the back of his dad’s Harley Davidson. Now, you can join him on his mission to uncover the best beers from all over the world. And you don’t need to travel nearly as far – just navigate your browser to beer52.com. The way it all works is simple. Once you decide to join, you pay a monthly subscription fee – and that’s it. In return, the team will select a premium range of craft beer and deliver it to your doorstep every month. They work closely with small and independent breweries, so whether you’re new to the world of craft beer or an experienced aficionado, you should always find something new and surprising in your box every month. And because they work with the people who make the beer, you’ll get a chance to learn something about what’s in your glass as well as enjoy a high quality tipple. And don’t forget that you can also make big savings with a Beer52voucher code! Your monthly package will consist of 8 craft beers every month, each expertly hand-picked by people who love beer from breweries around the world. You’ll also get a copy of Ferment, a monthly magazine that’s packed full of articles and news about the craft beer scene, and you’ll even receive a complimentary snack specially selected to be enjoyed with your beers! To find out more about what’s on offer and to sign up for your own monthly subscription, all you need to do is visit beer52.com! With over 12,000 microbreweries on their books, Beer52 can always be relied upon to provide a selection that’s as surprising and unique as it is delicious. And with your Beer52 delivery charges included in your subscription, it’s an affordable way to learn more about beer. Want to get started? Don’t forget to pick up your Beer52 code to enjoy this fantastic service for even less money! Chance to save on your subscription by using a Beer52 code. Browse our website until you find the Beer52 code that’s right for you, then log on to beer52.com to begin searching. Enter your Beer52 discount code in the box provided and click ‘Claim’. Don’t ever feel disappointed by warm, substandard beer again! Make your home into your own quality pub with this fantastic monthly selection of delicious craft beers from around the world – and don’t forget to enter your Beer52 voucher when you reach the checkout to make big savings! If you’ve enjoyed shopping for craft beers with Beer52, you might also like to check out more great deals on delicious food and drink at stores like Ocado and Waitrose. Or, if those aren’t up your street, you’ll find plenty more deals to browse in our Food and Drink section. Log on to beer52.com to begin searching. Click ‘Confirm’ to confirm your subscription. Sit back and wait for your tasty beer box to arrive! Don’t forget to use your Beer52 code at the checkout! Need some help and support using beer52.com? Whether you want to chat about your favourite beers with someone who cares or you need some assistance in using your Beer52 code, the friendly and experienced team of staff will be only too happy to help. You can contact them by accessing the online Customer Services area here. Want to discover more about the world of Beer52? Why not follow them across your favourite social media networks? You’ll find lots of exclusive content including beer and brewery news, new product updates, special offers and much more. You can also use these pages to find out more about saving money with a Beer52 offer. Are you the sort of person who can’t properly enjoy something unless you know a little about the facts behind it? At Beer53 they understand your predicament, and as self-confessed beer nerds they like to find out everything there is to know about the beers that they’re drinking. And with Ferment Magazine, you can too! The magazine comes free with every monthly box of beer, and is packed full of beer and brewery news, tasting notes and much more. To find out more all you need to do is visit beer52.com and sign up for your monthly subscription of craft beer! And don’t forget to use your Beer52 coupon to save money while you shop! Know someone whose one true love is beer? Well now you know what to get them for the next birthday or Christmas! Monthly craft beer subscriptions make excellent gifts that just keep on giving! You can purchase a gift card for any subscription from one month to a year, or order a one-off gift box featuring the current month’s selection. Boasting 8 delicious craft beers from around the world plus a magazine and a personalized card, it’s ideal for any occasion and sure to raise a few smiles. You can also use a Beer52 promo code to save money at the checkout. Buy now online at www.beer52.com. My husband is always complaining about the bad beer on offer in the local pub, so I decided to treat him to this monthly craft beer box. And when I used a Beer52 code it was fantastic value for money too! 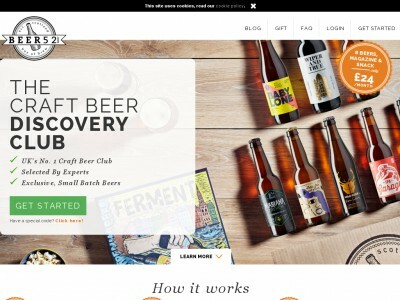 I just visited beer52.com and entered my details – and that was it! Now he receives a delicious box of beer every month. Absolutely loves getting an exciting new selection every month, and I loved the savings I got with a Beer52 voucher.